The next day a man walked into our booth, extended his hand and said, “Hi. I’m Dad.” He was also the President of the US Rowing Association, a former Olympic rower, and the Chair of the US Olympic Rowing Committee. Some folks love just one type of boat. but Monk Terry loves all sorts of boats. Monk has become a friend and advisor to our company. In the weeks and months that followed, Monk kept bugging us about the Miami Boat Show and finally forced us to do the show. Plus, he offered us the use of his guest house. Each day, after the show, we would go rowing with Monk. The first few days it was in our Guideboats. Then Monk asked, “How about trying a rowing shell?” Well… Sitting on the shell (one which Monk said was a very forgiving trainer) made us nervous. You could feel that the shell wanted to turn over. We’re not used to keeping a boat upright, that’s the boat’s job. We took 10 or 20 strokes, Monk standing in the water, holding the boat, not letting it move forward. Finally, we said, “Monk, as soon as you let go of this boat it’s going to turn over—one stroke and the boat’s going to be on its side.” Monk kept saying that it would be fine, but we could tell what was going to happen. Finally, we said, “Monk, let’s grab one of our boats, you take this boat and we’ll go out rowing and have some fun.” Which is just what we did! Only one person commented on the sign during the entire run of the show. When he asked, we said, “Well, 70% of the world is covered with water. Let’s randomly pick a dozen rowing sites and see how many races you win.” He nodded his head, knowing what the result would be. 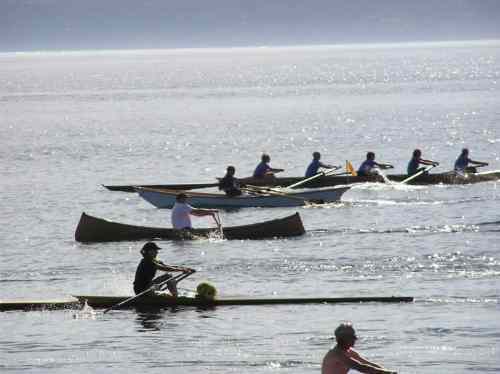 We’d have to pick 1,000 or 10,000 rowing sites before we came up with water calm enough for a shell. And then, of course, the shell would beat the pants off our boats. Scullers seem to cope with the limited range of rowable waters quite well. The Charles, the Schuylkill, Lake Lanier, and the Connecticut River…..all offer protected waters on which scullers can find the flat water they need. Another limitation on a rowing shell is flexibility….if it’s a single, that’s the only way the boat can be rowed. If your wife wants to come along—too bad. The same is true for your golden retriever. Rowing shells do what they do—very well. But, what they do is very narrow. We explained that one’s perception of speed in a boat is highly subjective. She was confusing responsiveness and agility with speed. 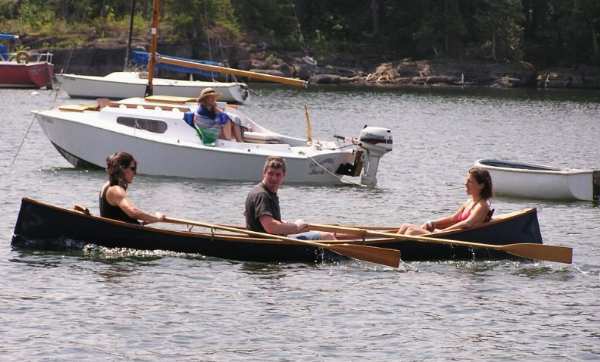 For those who like the sculling sensation, we can put sliding seats into our Guideboats or our Packboats. Our oars are typically fixed, meaning they can’t be feathered. However, for those folks who would prefer feathering oars—it can be arranged. We are sometimes asked if our boats can be rowed in tandem. No problem. But you will need a second set of oars, and perhaps a second foot-brace. And, oh yes, a third person (or a lot of ballast) to keep the boat properly trimmed. There are lots of boats and boat types. We truly feel that the most important thing is just being out on the water. Whether it’s a canoe or a kayak, a rowing scull, or a raft, or even an inner tube… it’s being out on the water, connecting with nature, with friends and family—that is most important.